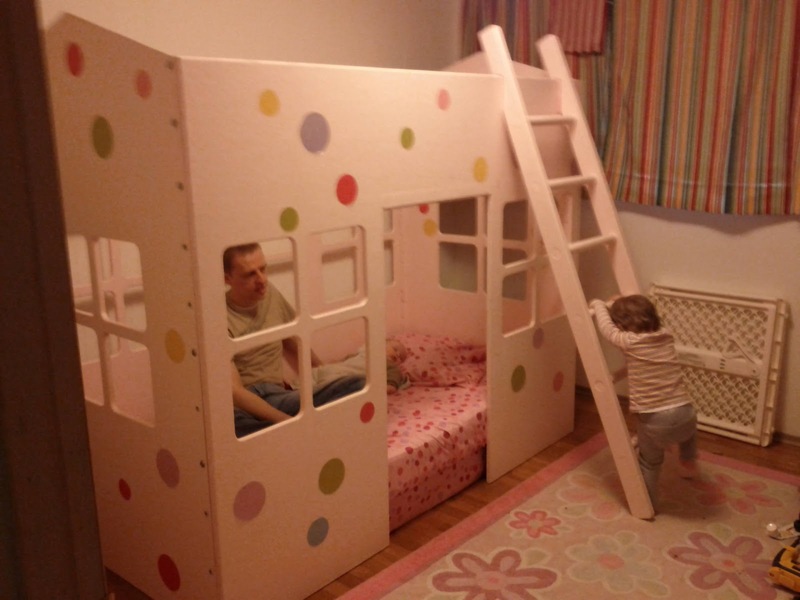 For Eloise's birthday, we got her a big kid bed. We moved her out of the crib a few months ago in anticipation of Benjamin needing it. 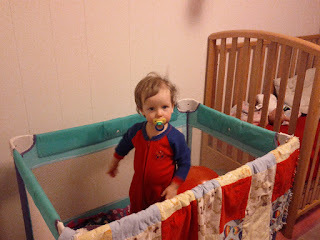 The playpen she was sleeping in was getting pretty cramped, to say the least. I don't think she could stretch out in it anymore. Note the bent legs in this picture from a couple of weeks ago. I found this bed on craigslist, and it looked like something I would have liked as a kid. We weren't sure how Eloise would take to it, since she isn't in the most adaptable phase if her life right now, but I bought it anyway. I intended to paint it, but doing things that require not having toddlers around, or not holding a baby, do not happen much around here right now, so she got it in all of its ugly original pink. We will paint it eventually. Todd put it together on Saturday. Jared and Eloise both though it was AMAZING, especially with the ladder on. It is a bunk bed, but the top bunk is not on it right now. 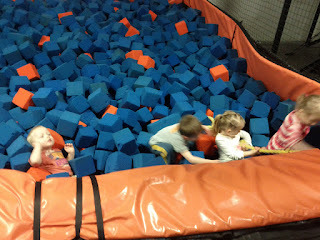 The kids have spent a lot of time jumping in it. 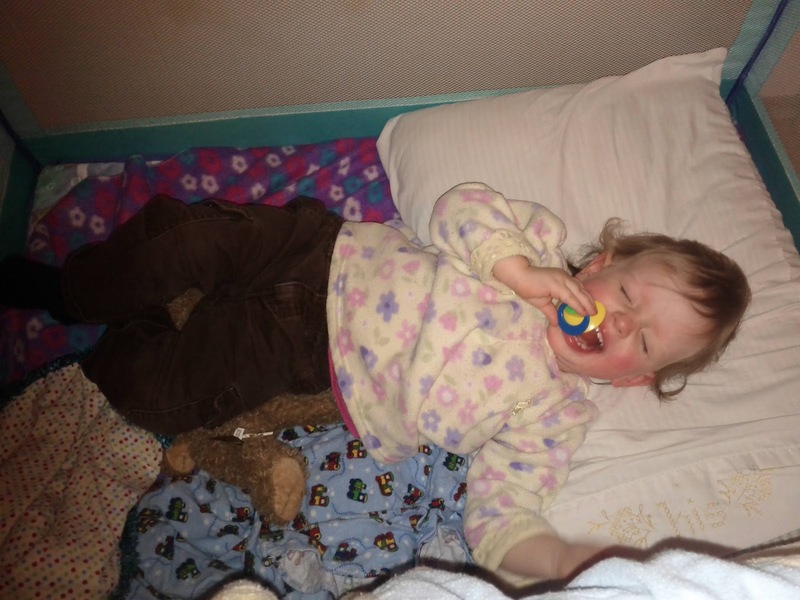 We weren't sure that Eloise would like to sleep in it, but she asked to nap in it the first day, and might even be sleeping a bit better than she was before. 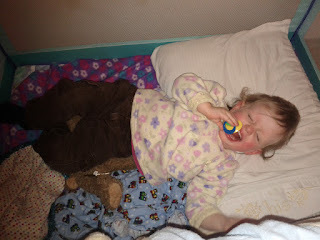 It could be the extra space, or all of the bed jumping making her more tired. She could also be more tired because Jared is waking her up at the crack of dawn so that they can jump on the bed together. Whatever it is, the bed is just as cool as I thought it would be. 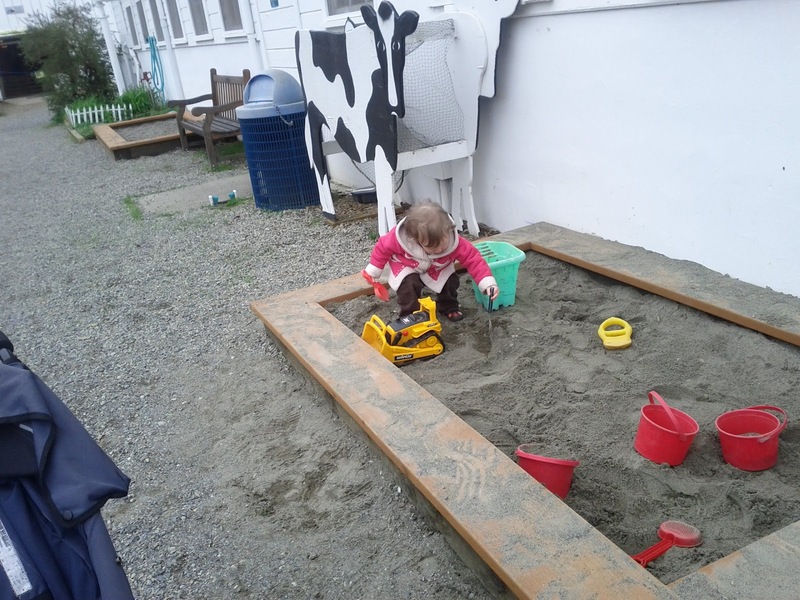 Eloise hasn't figured out that she can get out of it on her own, yet, which is an added temporary bonus. Today was Eloise's two year old well checkup at the doctor's office. We are a one family circus when we go out in public. 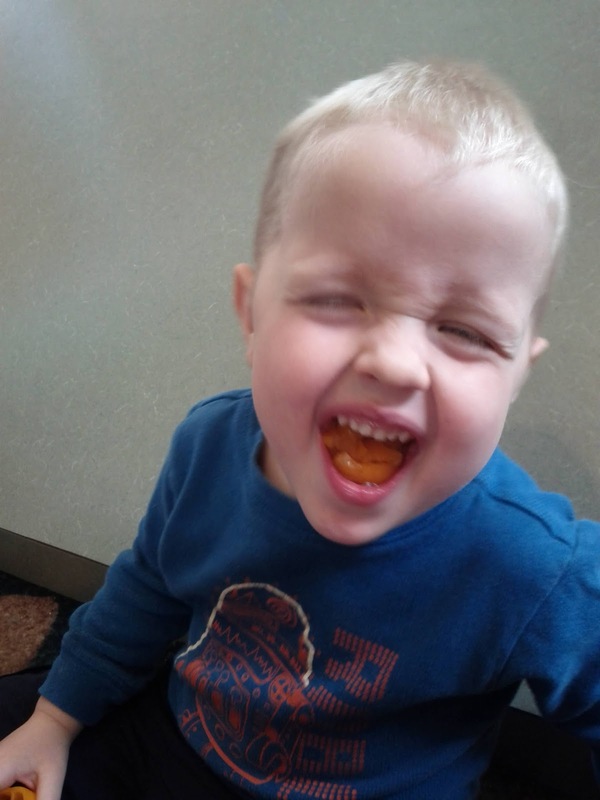 Benjamin alternated between smiling at nurses and eating for the entire visit. Eloise didn't have to get any shots today, but screamed for the duration of the exam as if it was the most painful thing ever anyway. I don't know what got into her. Normally she loves our pediatrician. Jared interrupted the scream fest, Benjamin eating, and me trying to talk to the doctor about some of my concerns right in the middle of the visit to say that he needed to go to the bathroom. Awesome. In spite of the theatrics, Eloise was given a clean bill of health. She weighs 27 lbs. 4 oz. 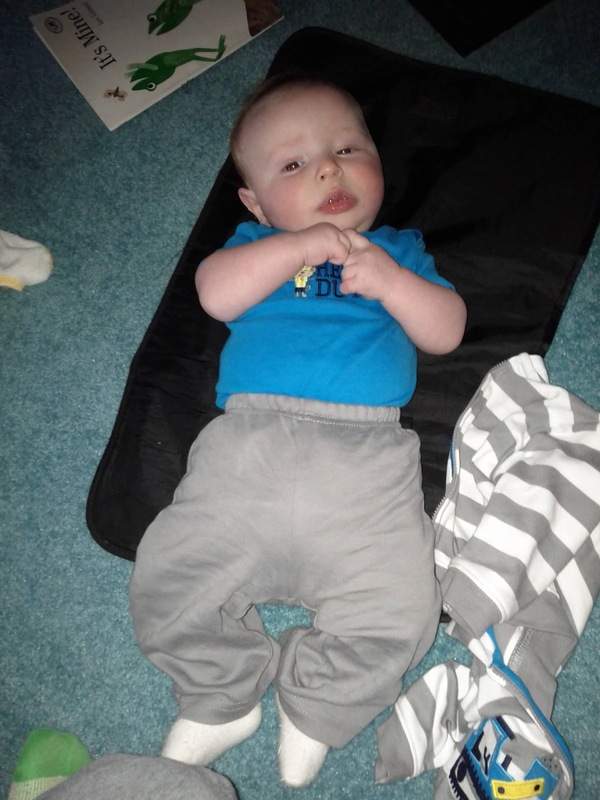 (60th percentile), and is 33 inches tall (25th percentile). 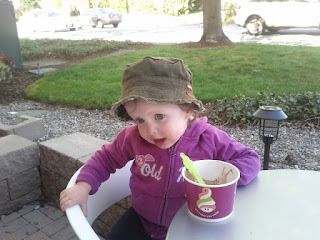 We went for frozen yogurt after the doctor's office visit. Eloise got her favorite, "chockick wogurt" chocolate yogurt. Jared went for pineapple yogurt covered in gummy bears, gummy worms, strawberries, and maraschino cherries. Gross, but colorful. Our Eloise is pretty much the cutest thing ever. Happy, happy birthday, Eloise, dear! Today is Eloise's birthday. She is two. 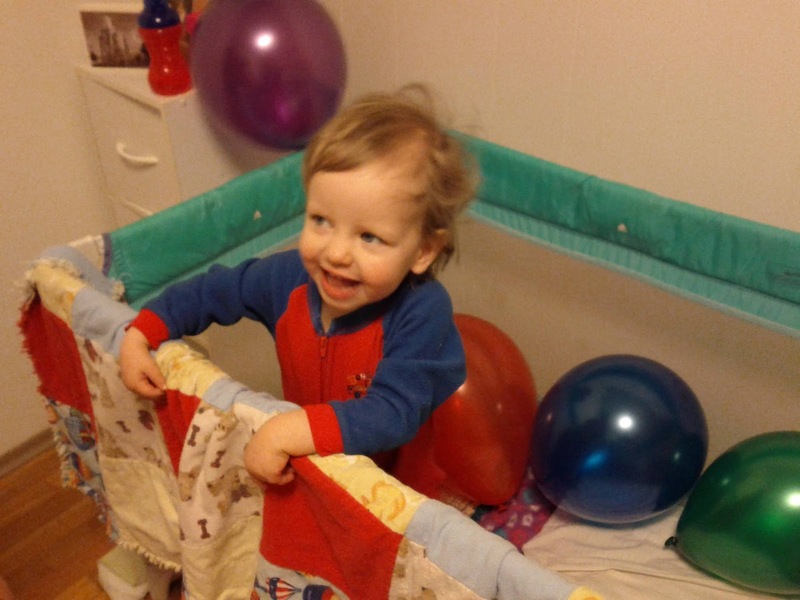 We celebrated on Saturday, starting with balloons in her bed when she woke up in the morning. We didn't plan anything big for Eloise's birthday this year because she gets skittish in new environments, or with people she doesn't know well, and we wanted her to be able to be comfortable and enjoy her special day. 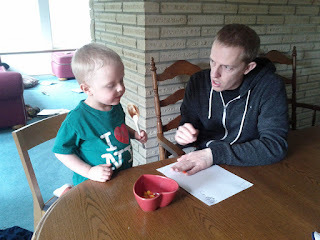 We played with balloons all day, and then we had cake and ice cream as a family before dinner. Notice that Jared is already covered in chocolate from licking the cake batter spoon. Jared was probably most excited about the eventual popping of the balloons. He kept asking if it was time to pop the balloons yet. 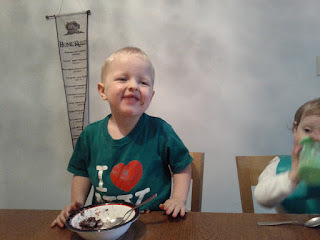 Well, he was pretty excited about cake, too. Benjamin was wondering, if he looks really cute, will we give him some cake, too? Eloise is getting a playhouse bed from Mom and Dad, but we haven't painted and assembled it, yet. 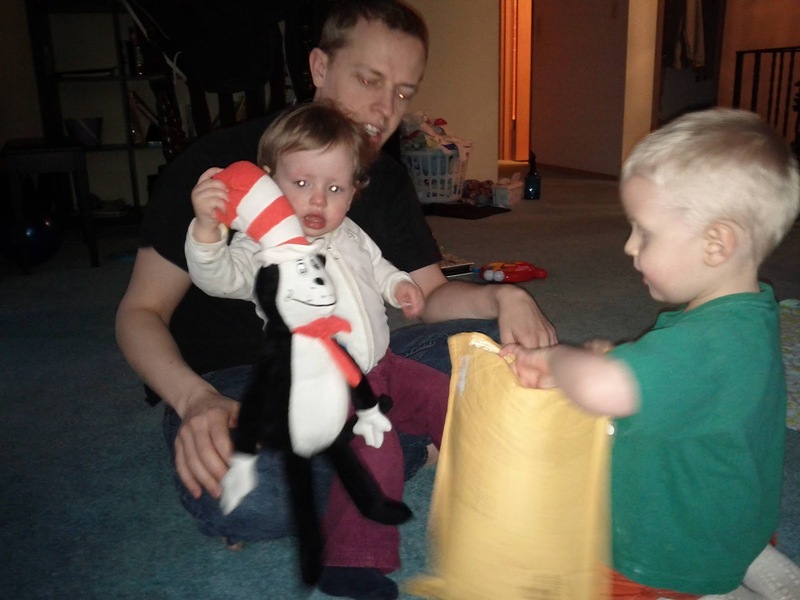 So the one and only present she opened was The Cat in the Hat from Grandma Jill, complete with the a stuffed cat companion. Eloise carries it around and pushes it in the doorway jumper like a swing. Today, on Eloise's actual birthday, Jared's preschool, for T week, had a field trip to a trampoline place that does toddler time on Tuesday and Wednesday mornings. Eloise was really excited to go jump on trampolines, but (as I suspected would happen) the minute we walked in the door, she changed her mind about trampolines being exciting, and started to cry. Jared jumped right in. 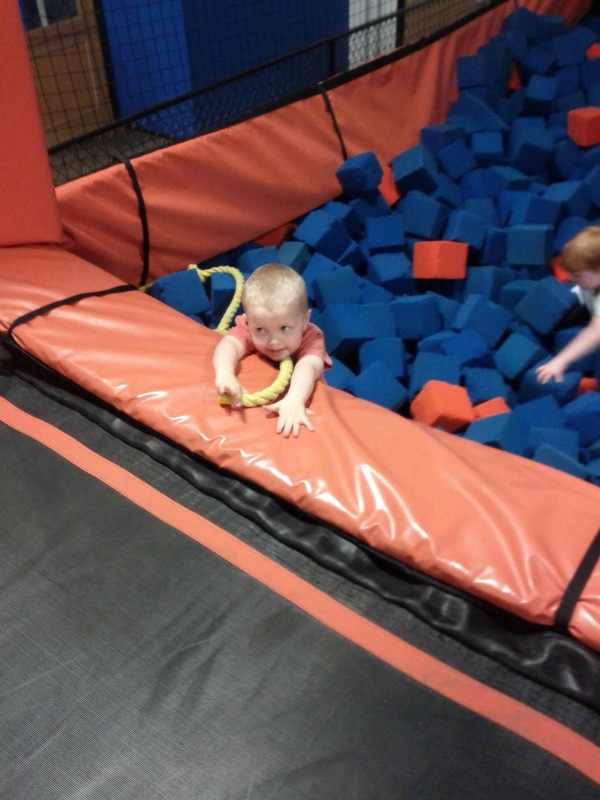 Here is Jared an hour into the jumping, having a little rest in the foam pit while the rest of his preschool class plays. Eloise parked herself on a chair with a ball, and I was afraid that she was going to stay there the whole time, but I eventually negotiated her out onto the trampolines. 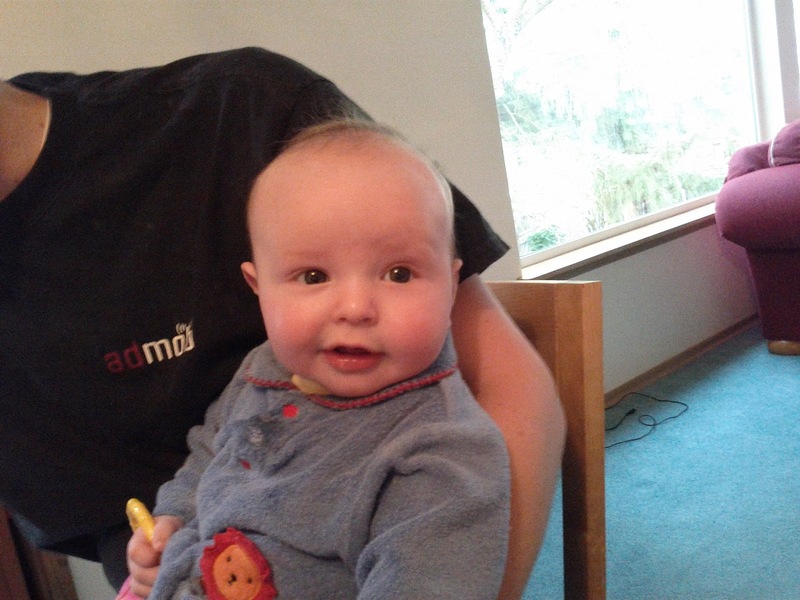 A few minutes later she let me put her down. A few minutes later she let go of my hand to take a few jumps on her own. Eloise never got very comfortable with trampolines. Ten minutes before the end of toddler trampoline time she announced that she was ready to put her shoes and jacket back on. 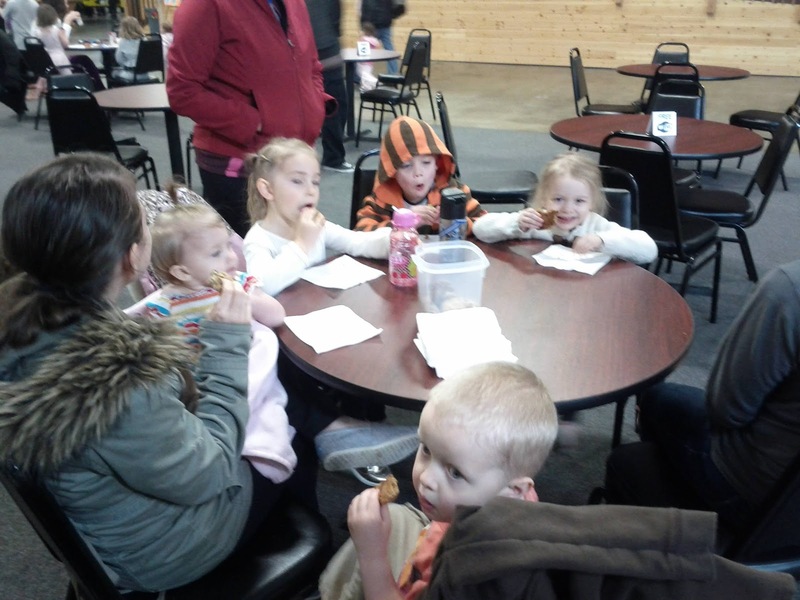 When the other kids joined us, we shared some birthday treats- chocolate chip cookies. 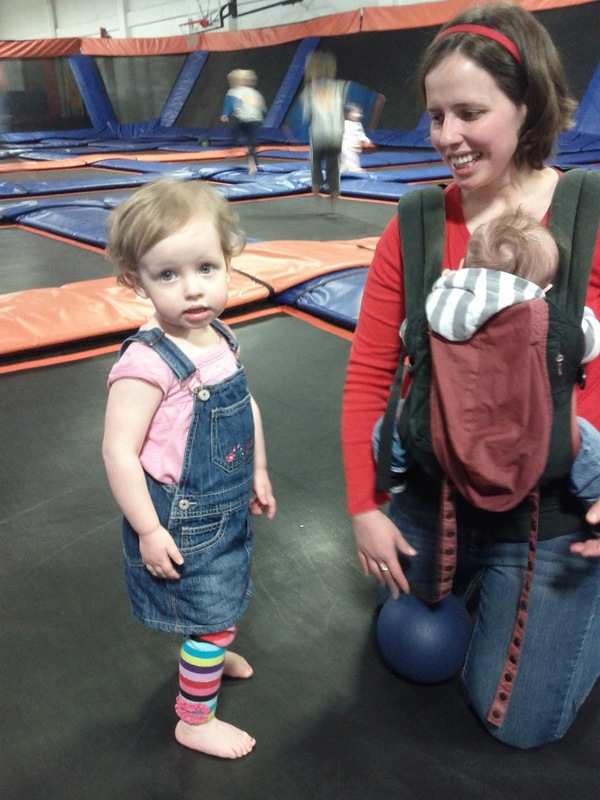 As we were leaving, Eloise told me that trampolines are fun. A couple of weeks ago, Jared told me how nice his little friend is right after she hit him in the face with a toy. I'm giving both statements the same amount of credence. We made the right call having a small family birthday party this year. My friend Kristy told me this morning that nothing on earth is cuter than a two year old girl. I'm pretty sure that she is right. Happy birthday, Princess! Math is fun. Can we make it more fun? I've been reading a lot of books about homeschooling. 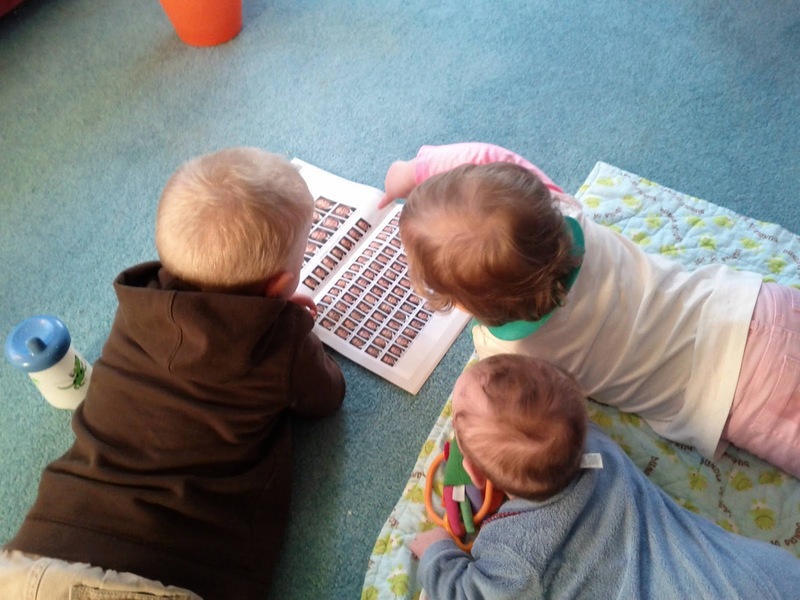 Many of the authors suggest that children should be taught subjects as they become curious about them. That makes sense to me. Well, a certain three year old in our house is fascinated with combining numbers, so Todd decided to give him a little introductory math lesson. 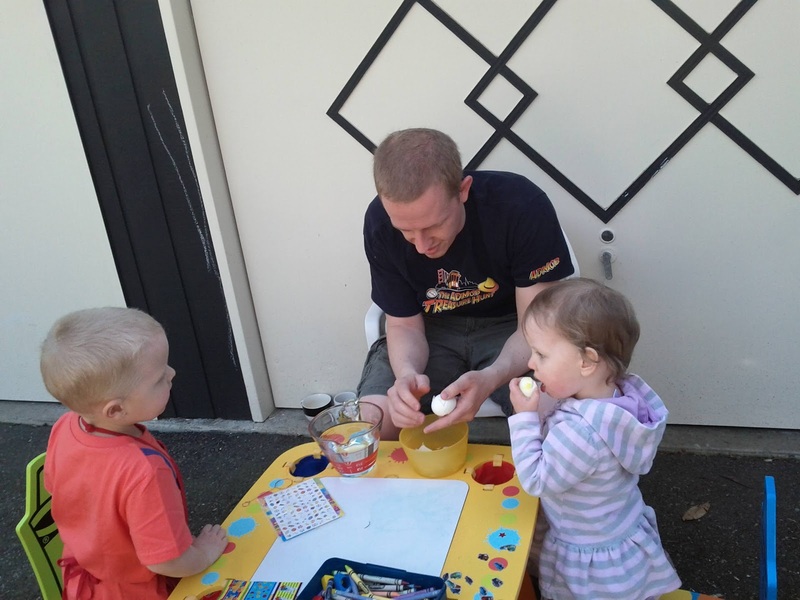 There is a Jewish tradition, when children start learning Hebrew, to give the children apples and honey so that Hebrew will always taste sweet in their mouths. 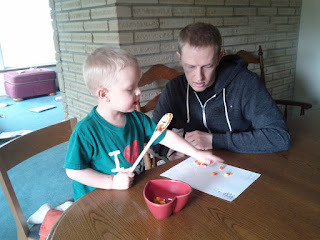 If apples and honey work for Hebrew, candy corn and cake batter should do wonders for math. Something is working. This math lesson has already gone on for over ten minutes. Hey, math teachers. How often do you hear your students say, "Let's do another one!" It's music in my ears. We have been extraordinarily busy this week. The fun started with General Conference on Saturday and Sunday. We got to hear some timely and inspired messages from living apostles and prophets. 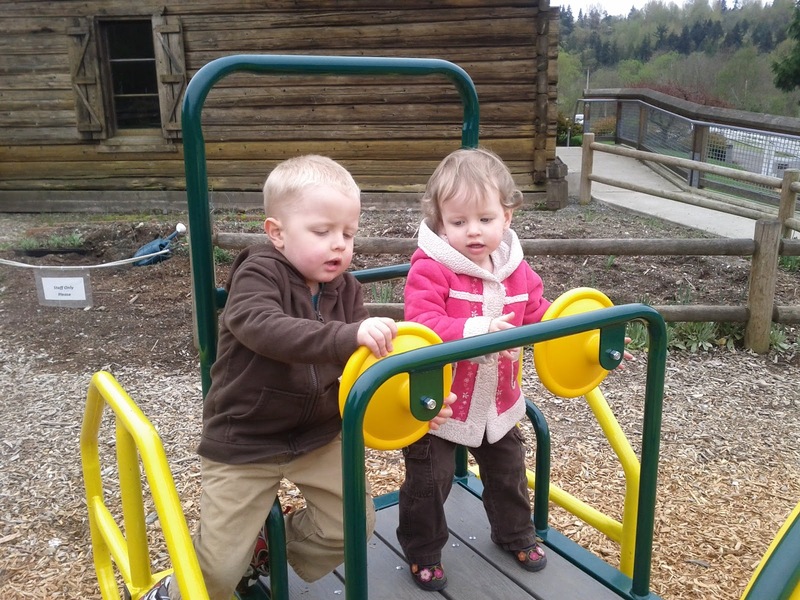 Jared and Eloise were pretty happy to play a lot and watch a little. 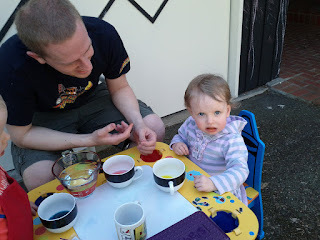 Unfortunately, Eloise was sleeping really badly due to congestion, but overall it was a great weekend. 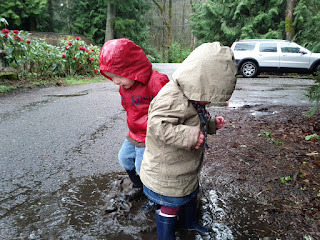 Between sessions of conference on Sunday, Jared, Eloise, and I went for a walk in the pouring rain. 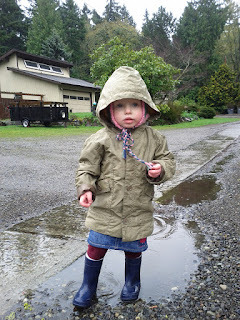 At least Eloise walked until she noticed that some of the sticks on the ground were wiggly worms. After that she preferred to be carried. 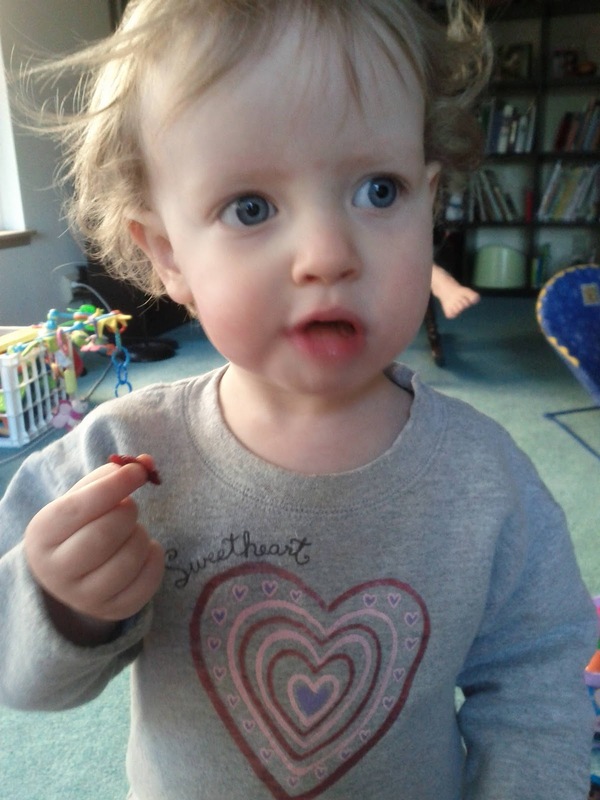 Eloise recently had an experience playing in the yard where a bumblebee the size of a small bird crawled across her hand. She was terrified. She screamed so much that I undressed her to check her whole body for stings. She was sting free, but, ever since then, the sight of the tiniest gnat sets her off. 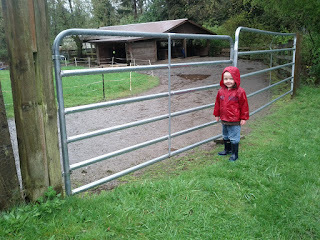 We wanted to see the neighborhood horses, but the horses decided they preferred the comfort of their shelter to the downpour we were standing in. They had the right idea. By the time we got home, we were more than ready for some hot chocolate. On Tuesday, we hosted Jared's preschool. Only two of the children came. It was my first time teaching, and I didn't feel like it went very well, but I learned a lot for next time. I was still grouchy about preschool after naps, so, when Eloise woke up extremely early, I decided to go on an exploratory trip to Kelsey Creek Park. It wasn't raining at the moment, so I decided to risk the possibility of rain starting during the 25 minute drive. We could always divert to the mall play area. I really needed to get out of the house. 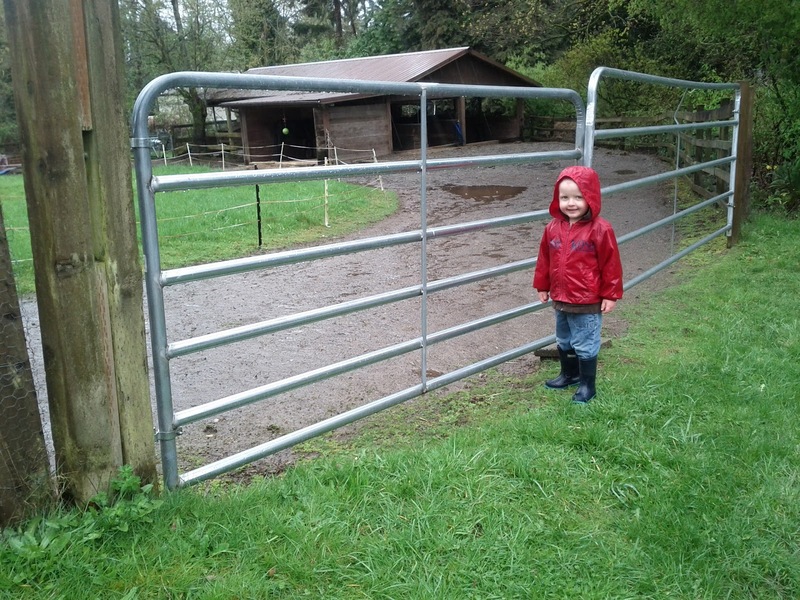 Kelsey Creek Farm/Park ended up being exactly, amazingly perfect for Jared and Eloise. 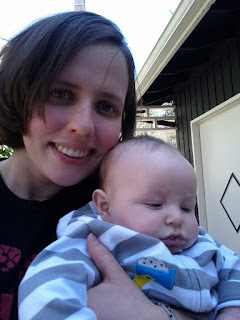 Benjamin slept through the whole experience (two and a half hours). We found farm animals and wild animals. If you zoom in on this picture, there is a wild cottontail rabbit grazing near the gate on the opposite side of the field. There was some kind of play area for small kids every hundred yards or so. Eloise loves to dig. I was surprised how close Eloise let this goat get to her. 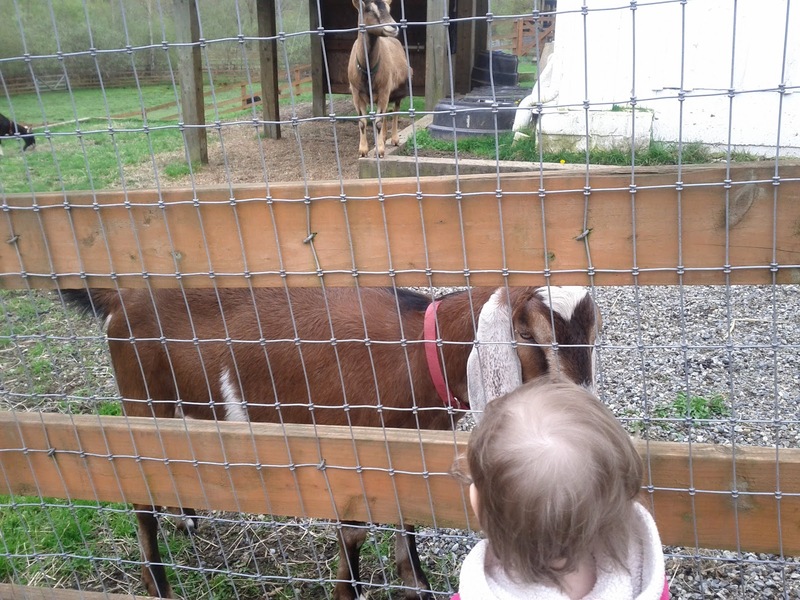 For a girl who can't tolerate the tiniest bug, she turned out to have a fairly high tolerance for farm animals bleating in her face. 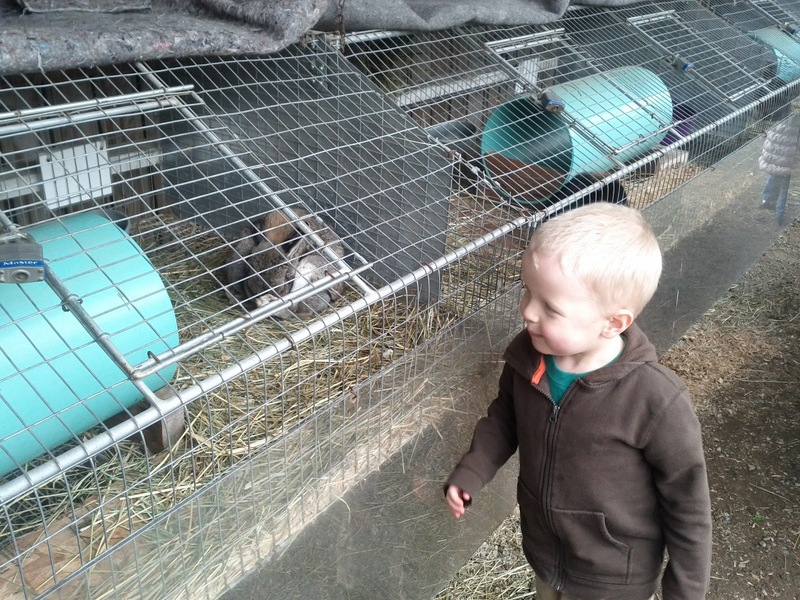 Whenever we go to the zoo, Jared's favorite exhibit is the bunnies. Kelsey Creek Farm turns out to have even more bunnies than the zoo, and the farm is free. You can't beat that. Also, the farm ingeniously has the names of the bunnies on placards above their cages. I can't figure out why no one has ever done this at the zoo. 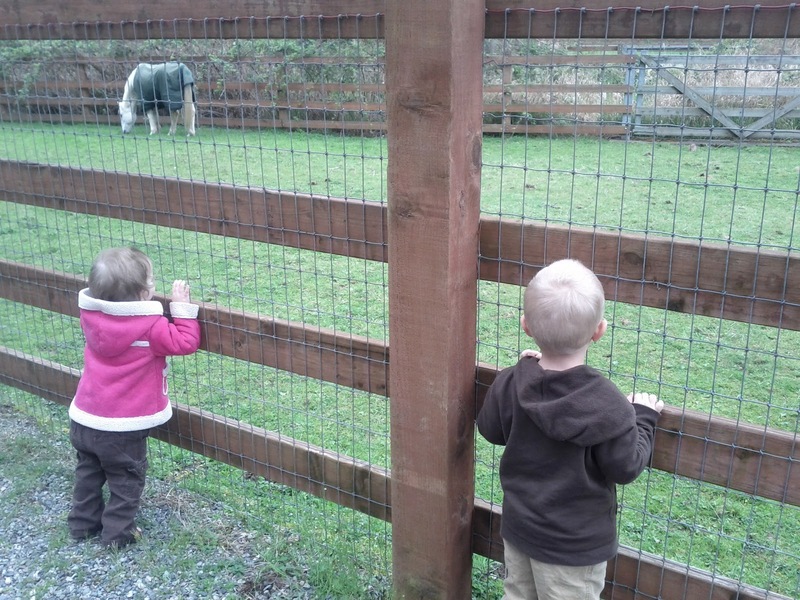 I struggle to remember the names of the three zoo animals we do know (thanks to zoo preceptors standing outside their pens), and the kids are forever asking me the names of the animals we don't know. Jared and Eloise enjoyed this little tractor playground, until a fly landed on Eloise's steering wheel. She called out, "Scary! That bug makes me feel lonely!" I think she believes "lonely" and "scared" are synonyms because Jared uses them in approximately the same contexts. 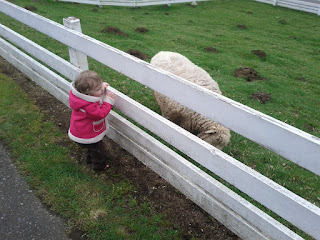 Eloise was really excited about this big wooly sheep. "Wook, Mom! A Sheep! I want to ride on it!" I think she really wanted to cuddle it, since it was so fuzzy. Kelsey Creek Farms has a sheep shearing event coming up in a few weeks, so the sheep are currently wearing their full winter coats. 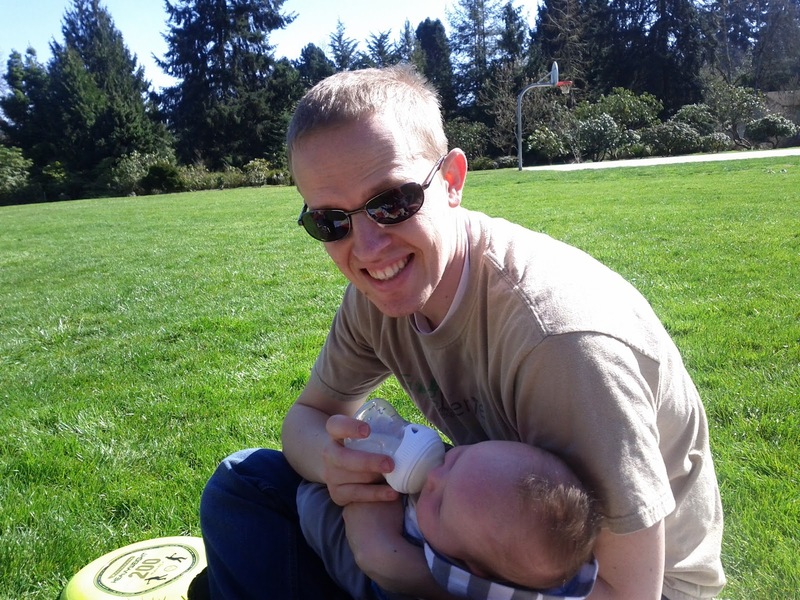 Before we headed home, we stopped at the biggest playground yet so that I could try to wake B up and feed him before the drive home. I made the mistake of reading out loud a sign advertising piglets coming to the farm at the end of April, so Jared has reminded me at least a dozen times that we have to go back in two or three weeks to see piglets. We picked up Daddy on the way home, and, since I didn't much want to cook, he took us out for Mexican food. Benjamin has a new skill today. 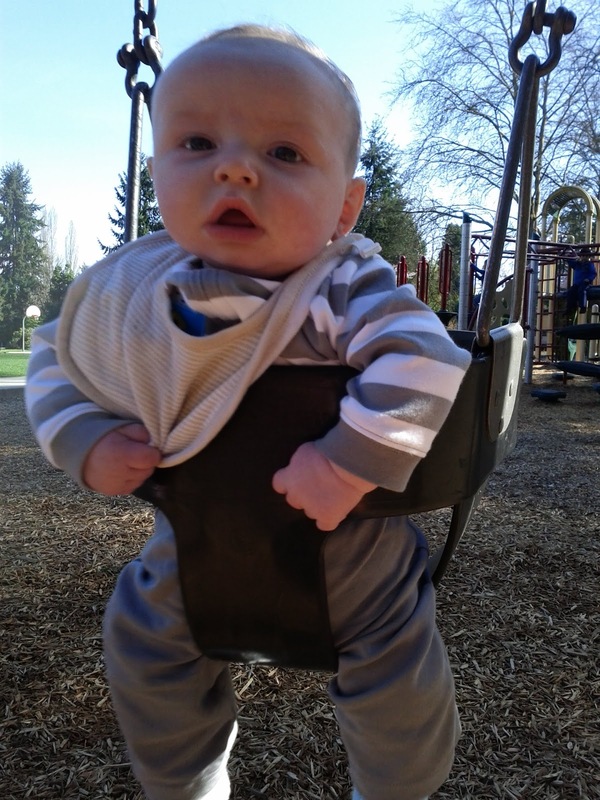 Despite the lack of regular parental attention in his life, he persists in getting bigger and stronger. 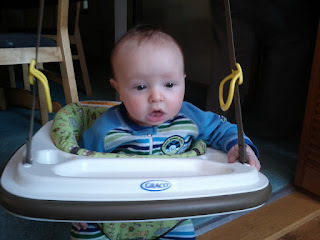 Today I realized that he can grab a toy held in front of him with both of his hands, and get it to his mouth. Those tiny little baby fists are opening up into dexterous little hands. It is amazing to watch him develop. Jared also has a new skill today. 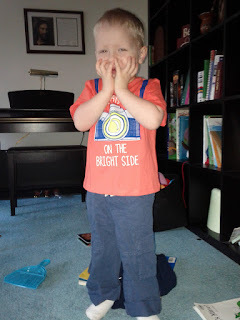 He read a whole story that he had never seen before without help! He had a little encouragement from me, but he sounded out the words he didn't know without help. The book was a BOB training book, with a lot of three letter words, but it is really exciting to see him doing it on his own. This afternoon Jared and Eloise had dentist appointments. In spite of Benjamin wanting to be fed while Jared and Eloise were taking turns on the dentist's table, and Eloise needing an emergency diaper change while I was trying to feed Benjamin, the kids were great for their exams and cleaning. Eloise even got on the table to get her teeth brushed and have fluoride applied. It helped that there was a movie playing above her head. The kids left with a clean bill of dental health. 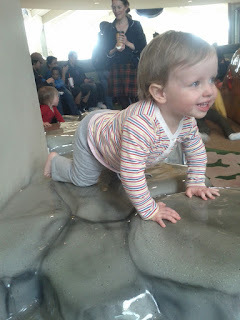 After the dentist, I took the kids to play at a nearby mall play area. 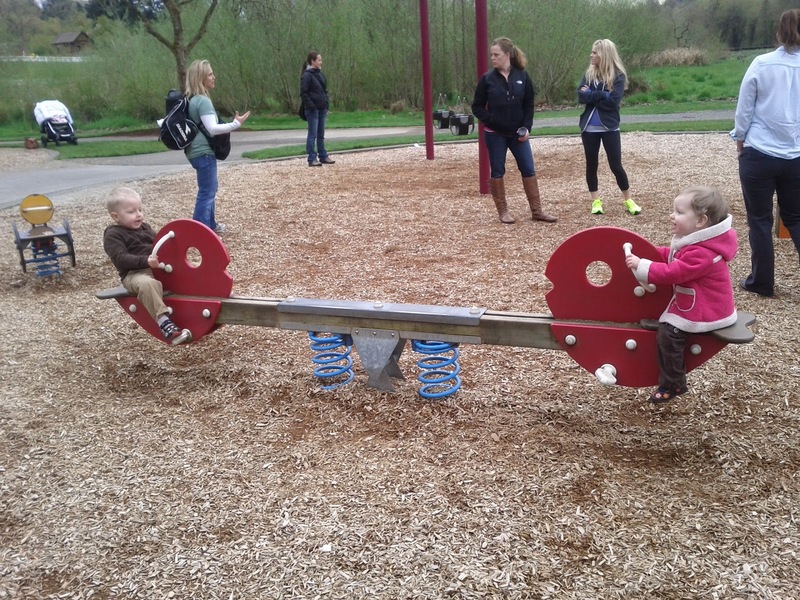 I forgot that the local schools have spring break, so the play area was a madhouse with a lot of children who are too old for the play area. Eloise eventually let go of me and climbed on a boat. Then she kept getting my attention to tell me, "Wook, Mom! There are children on my boat! Lots of children on my boat!" She was inevitably knocked over by a bigger kid, but she still managed to have a good time. Look at those perfect pearly whites. . . and a yellow pepper. Benjamin was so tired, and so absorbed with watching the kids play, that he flopped over on my arm and fell asleep without me even noticing for a couple of minutes. I brought home three very exhausted children. After an abbreviated evening routine, Jared climbed into bed and fell asleep before anyone made it to his room to tuck him in. This picture is not related to the following post. It just makes me smile. On Monday, Colette asked me if I had any pictures with all three of my kids in them. 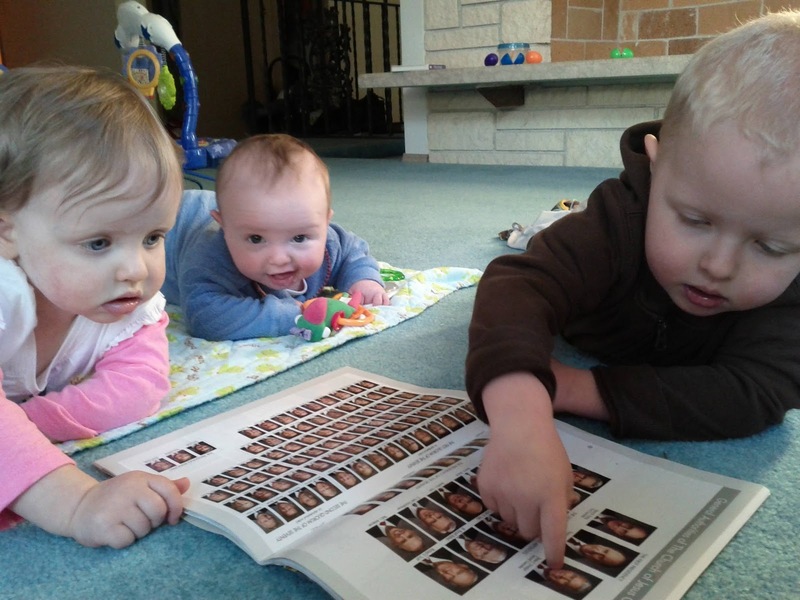 She wanted to print some current cousin pictures for her kids to see. My selection of pictures of my kids was sparse, so I spent the day attempting to get a shot of all three children, with no screaming, crying, ear covering, or sibling bashing. It took all day, and many failed attempts, but I finally got a couple of okay candid shots. This was not easy. I hope you appreciate the work I did, Colette. They were very absorbed in Family Home Evening. We practiced identifying apostles and prophets who will be speakers at this weekend's General Conference. I like how Benjamin is pretending to be interested. 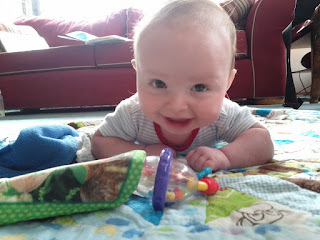 He was pretty excited that Jared and Eloise were willing to share his tummy time. We are waiting anxiously for General Conference on Saturday. We can't wait to hear a prophet speak! Our Easter was busy and full of fun, starting on Saturday with a picnic at the park. 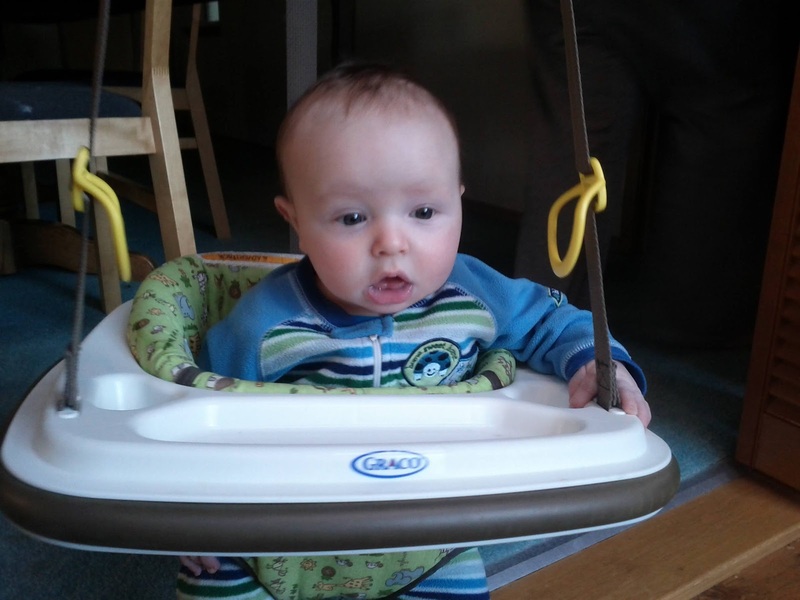 Benjamin had his first experience in the swing. Don't let the stare fool you. He was a lot more enthusiastic about swinging than either Eloise or Jared their first time. We stayed at the park until the nap time breakdown. 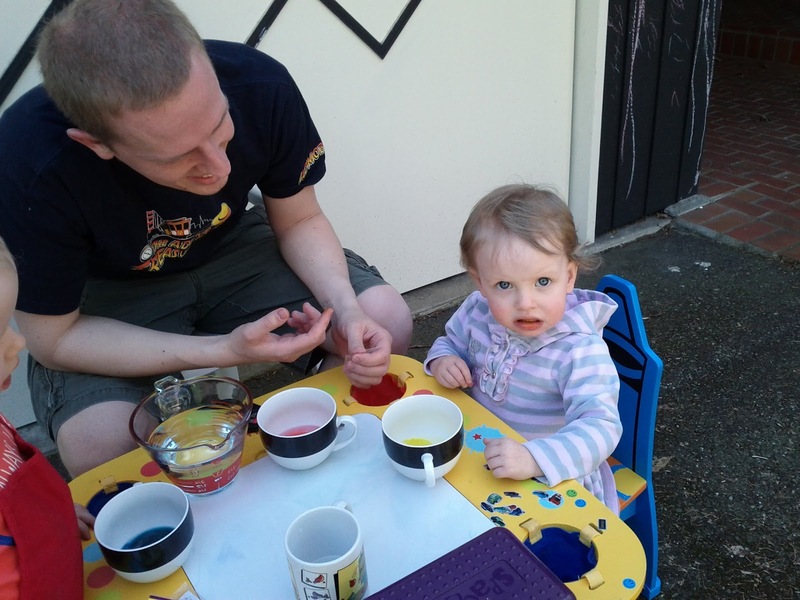 After Eloise napped, we reconvened for egg dyeing. 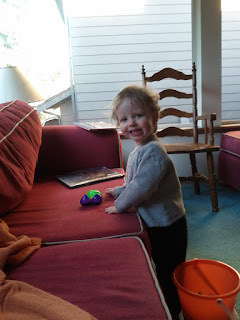 Someone (adult pictured below) was concerned about getting dye all over the house, and insisted on dyeing eggs outside, What he should have been worried about was a couple of hungry little Knights eating all of the eggs before they could make it into the dye. He should also have worried about the possibility that handing an almost two year old a color tablet to drop in a cup of vinegar would result in the child immediately popping the candy sized tablet into her mouth. 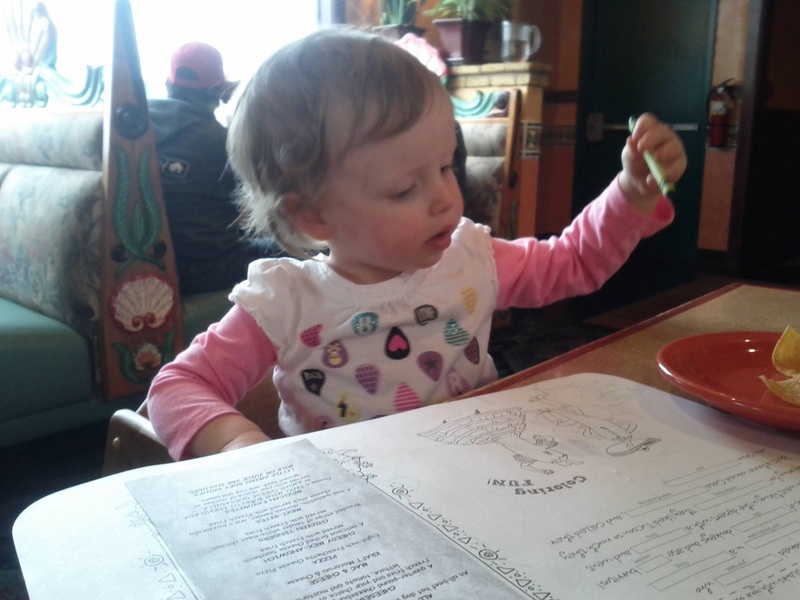 Fortunately, the yellow color on her lips and tongue faded after a couple of hours, the tablet wasn't swallowed, and, in spite of everything I read online about artificial colors in foods, Eloise's behavior did not appear to be significantly altered after ingesting pure yellow. A few days before Easter we received an Easter package from Grandma and Grandpa Knight. The kids got new clothes. Jared and Benjamin were semi-cooperative models. Eloise prefers to be on the other side of the camera. She was much more interested in the toy cars that came in the package. 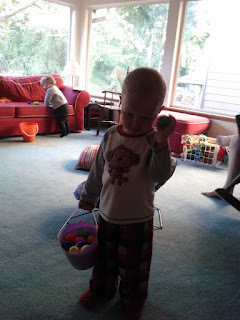 Easter morning we had an egg hunt. Eloise, once again, just wanted to eat. 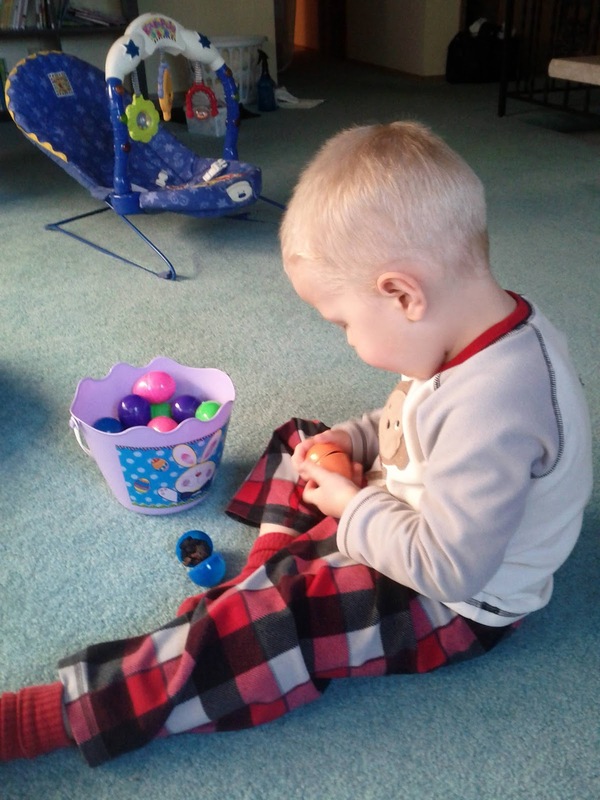 She let Jared find most of the eggs. I wonder how much longer we are going to be able to get away with filling the Easter eggs with goldfish, raisins, and teddy grahams. There weren't any complaints this year. 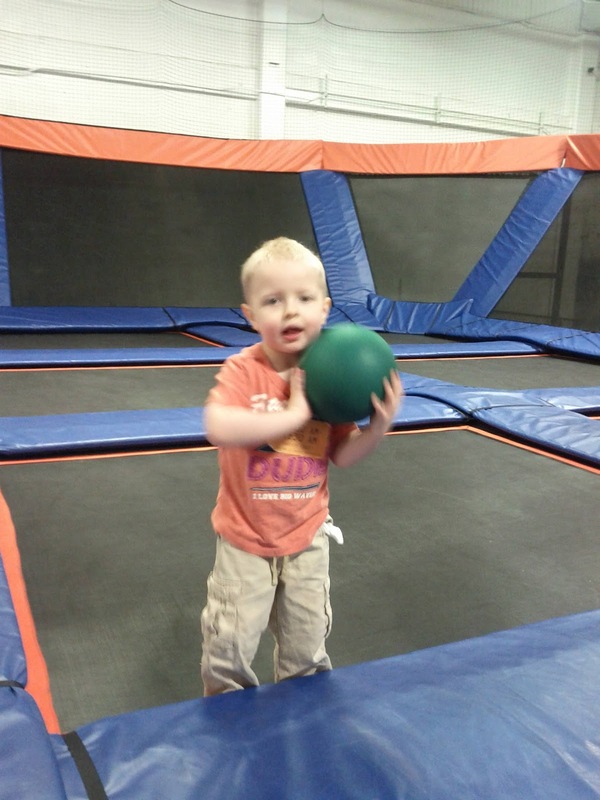 B enjoyed the fun from the jumper. This toy is a lot more exciting with siblings. Eloise likes to spin B around in circles. Today she asked me to hang it up so that her bear could swing. Better the bear than the brother. After Jared and Eloise were ready for church, they went in the front yard with Todd, and did egg hunt reenactments for half an hour until it was time to go. Church was a good opportunity to reflect on the reason for Easter. We had a great program, with music and speakers celebrating the atonement and resurrection of Jesus Christ. 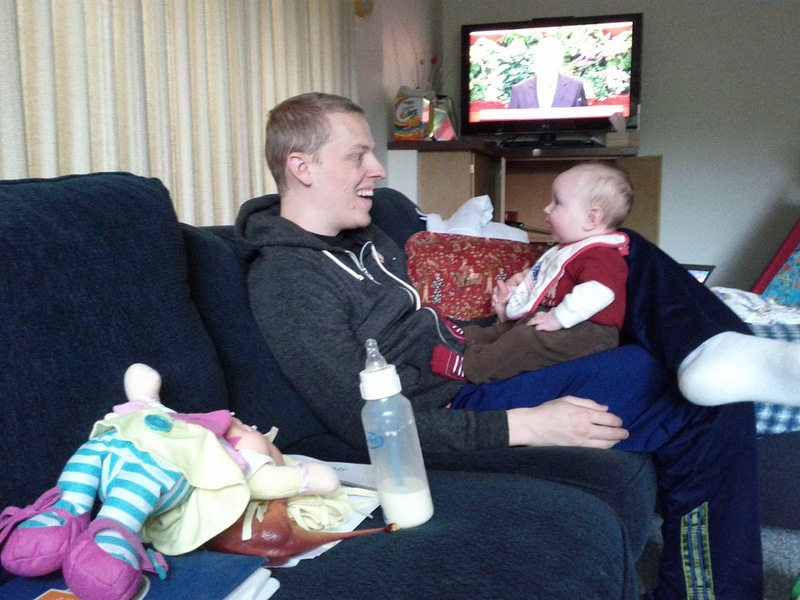 After church, we had Easter dinner with a family from church who have ten month old twins. It was a busy, happy day. Happy Easter!